This ’Cat shares the same ATV values as its bigger sibling but as a two-wheel-drive ATV that is $100 cheaper for 2017. The liquid-cooled, 270cc four-stroke has proven peppy and reliable. Double-A-arm suspension covers the front, while solid-axle, swingarm suspension smooths the rear. It can tow 500 pounds and features hydraulic disc brakes. Arctic Cat’s 2WD 150 features racks and 300 pounds of towing capacity. The air-cooled, 149cc SOHC, four-stroke engine is reliable. Single-A-arm front suspension and a swingarm rear handle bumps. An automatic CVT transmission transfers power. The quad does 20 mph stock, but can be adjusted to go 30 mph after the rider gains experience. 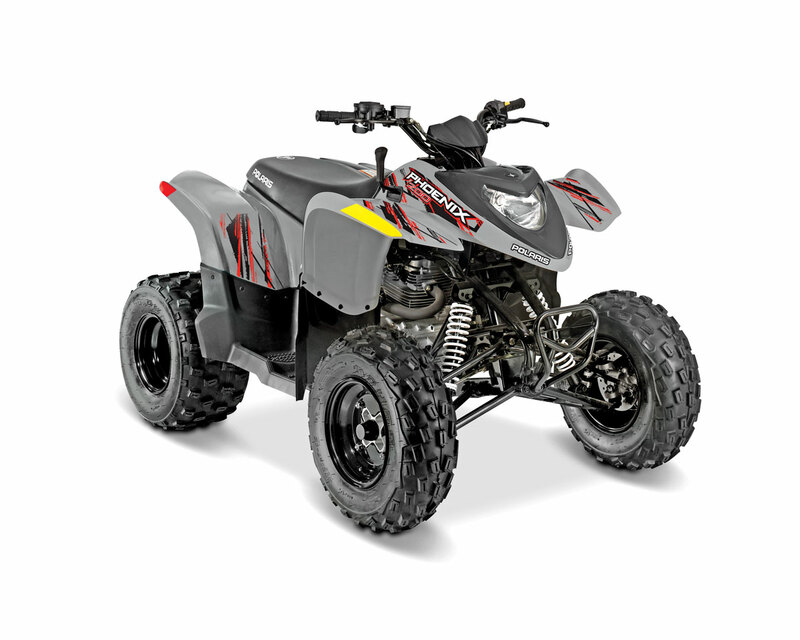 The FourTrax Recon has a durable, 229cc, air-cooled, four-stroke, single-cylinder engine that is electronically started and requires low maintenance. It has an automatic clutch system that still allows you to shift gears. For $250 you can step up to the Recon ES (Electronic Shift) model and have push-button shifting on the handlebar. Honda has many variations of this ATV, which includes a 4×4 version, but if you want a strong engine and only require two-wheel drive, the Rancher is a great machine. It utilizes a 420cc, single-cylinder engine with a manual five-speed transmission that has reverse. The base-model Rancher has a solid rear axle with 6.9 inches of wheel travel. This reasonably priced utility ATV is capable of towing up to 500 pounds with a 271cc, four-stroke, single-cylinder engine that is liquid-cooled and electronically started. There is a back-up pull starter if needed. An automatic CVT-style transmission with reverse helps propel the twowheel-drive quad. There are cargo racks on the front and rear of the Brute Force 300. The Kymco MXU 300 is closely related to Kawasaki’s Brute Force 300. Both machines have electric start for the single-cylinder four-stroke engines. The Kymco has a 270cc displacement and an automatic CVT-style transmission with reverse. Hydraulic disc brakes come standard up front and in the rear of this machine. The MXU 150 sports a 149cc, air-cooled, four-stroke engine paired with an automatic CVT-style transmission. This rear-wheel-driven machine has drum brakes in the front with a hydraulic disc brake to slow down the rear. It is started electrically, but the MXU comes with a back-up kickstarter in case the battery dies while you’re out on the trails. Intended for riders 14 years old and up, the friendly but sporty Phoenix has a reliable, 196cc, air-cooled, four-stroke engine with a PVT transmission. The trans has forward, neutral and reverse. A double A-arm in front supplies 7 inches of travel, and a swingarm rear has 6.5 inches of travel. The Phoenix comes with a helmet and safety flag! Suzuki’s Ozark 250 is a great two-wheel-drive ATV that packs a punch out of its 245cc, air-cooled, single-cylinder, four-stroke engine. For durability purposes, the rear wheels are shaft-driven through a solid-axle swingarm-type suspension. The front suspension utilizes independent dual A-arms. There are cargo racks on this quad.